Dealing with a fungal infestation in a residential or commercial property is no fun at all. Fungal and mold infestations can cause a lot of property damage. Even worse, it can cause health issues for those who inhabit or frequent the property. When home and business owners in Portland have an infestation issue on their hands, the team at 911 Restoration of Portland is ready to provide total property restoration and mold removal services. Mold infestations typically occur due to water damage. At 911 Restoration of Portland, the highly trained mold removal team has received extensive training on detecting the water damaged area. Once the water source has been identified, the team can provide water damage restoration and mold removal services. Disaster seems to strike at the worst time possible. Though there is never a convenient time to experience a mold infestation, most issues seem to appear right before the holidays or a big event. However, Portland residents can rest easy knowing that the mold removal experts are available 24/7, 365 days per year. As soon as an issue is suspected, call our team to schedule an appointment for mold remediation and water damage restoration services. Property owners will receive peace of mind and the property will be better than new! When it comes to mold removal services, it is important to reach out as soon as damage is suspected. These infestations have the potential to become worse the longer they sit. It is also important to reach out to the mold removal team at 911 Restoration, rather than try to remediate the issue yourself. Mold infestations can be worse than they appear and can cause serious harm to health, especially if black mold removal services are needed. 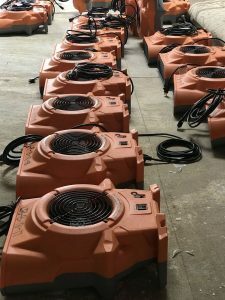 Our team has the tools and equipment needed to provide mold removal and mold remediation services safely and efficiently. Restore your peace of mind and get on the path to pre-damage condition by calling the team at 911 Restoration of Portland today! Mold infestations can often go undetected. However, there are a few signs to look for throughout a property that can help determine whether or not mold removal services are needed. Some mold infestations can be hazardous to the health of those in the area, so it is important to contact our mold removal team for services. Smelly odors. Many property owners detect the need for mold removal due to a musty odor in the air that they can’t seem to get rid of. If there’s an area in your property that smells musty, it could mean a mold infestation has occurred. Check around areas like the water heater or AC unit for water leaks. Leaks in these areas commonly go unnoticed. Keep in mind that not all mold puts out an odor. Cold Like Symptoms. Mold can take a toll on the health of those in the property. Many times you may just think you have caught a cold or are just feeling under the weather. However, if these cold like symptoms persist, mold removal services could be needed. Symptoms commonly include: coughing, sore throats, watery eyes, congestions, watery eyes and difficulty breathing. Stains or Discoloration. Contrary to popular belief, mold is not always black in color. It can be yellow, brown or a copper-like tone. Be sure to check your ceiling, tiles, walls and bathrooms for discoloration. 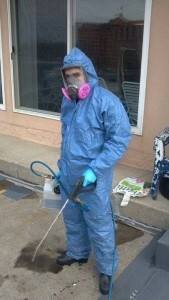 Mold remediation is just a phone call away for Portland area residents and business owners. Knowing the above signs of an infestation can help you to catch mold in the early stages and help to prevent the need for additional restoration services. Mold infestations typically occur because of undetected water damage in a property. In order for mold to colonize, the spores need a water source. Within 12-24 hours of sitting water, these tiny microscopic mold spores can begin to thrive and form the need for mold removal. At 911 Restoration of Portland, we provide water damage restoration services that help property owners avoid the need for mold removal. Whether your property needs water damage restoration services or mold removal, the team at 911 Restoration of Portland is ready to provide total property restoration. We have the knowledge, training and equipment needed to get properties back to pre-damage condition and give owners peace of mind. Call our trusted Portland team today!